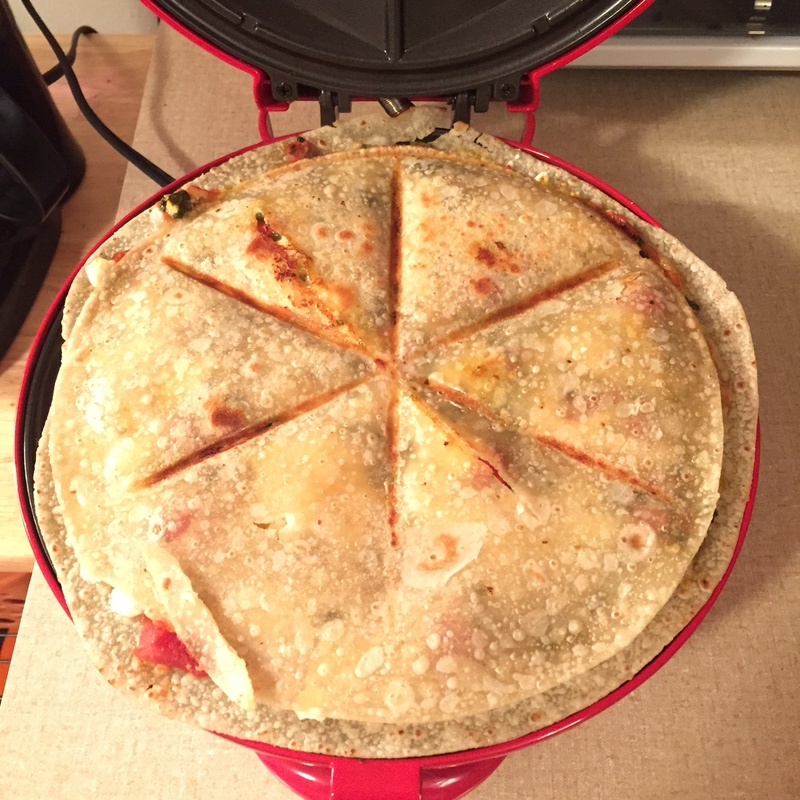 Ladies and gentlemen, I present…the pizzadilla. 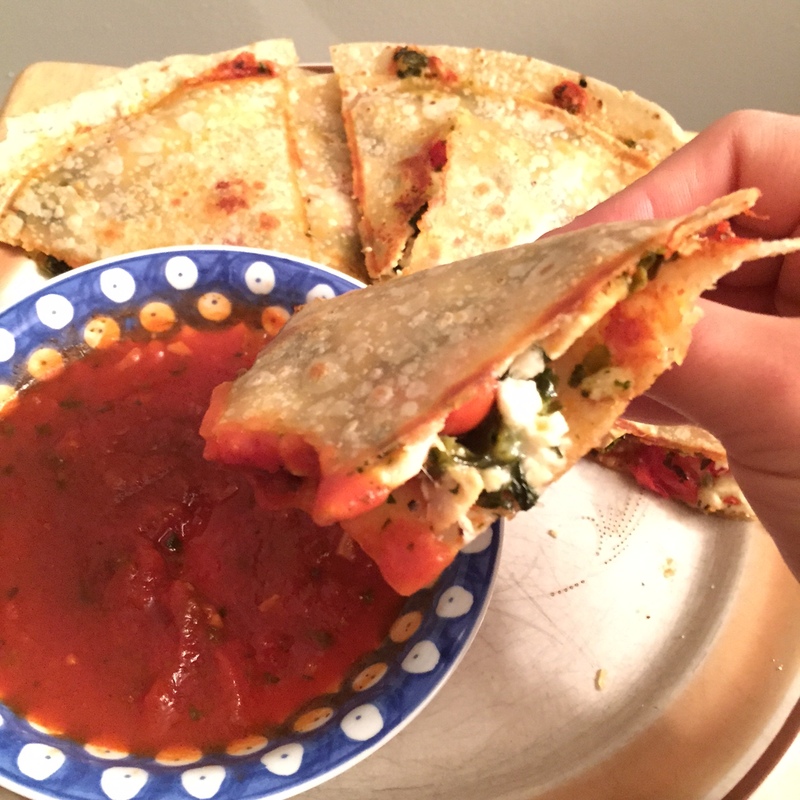 Where pizza meets the quesadilla in a delicious, cheesy, heavenly combination that’s perfect for dunking in marinara. The best part is that it can be ready in about 10 minutes! 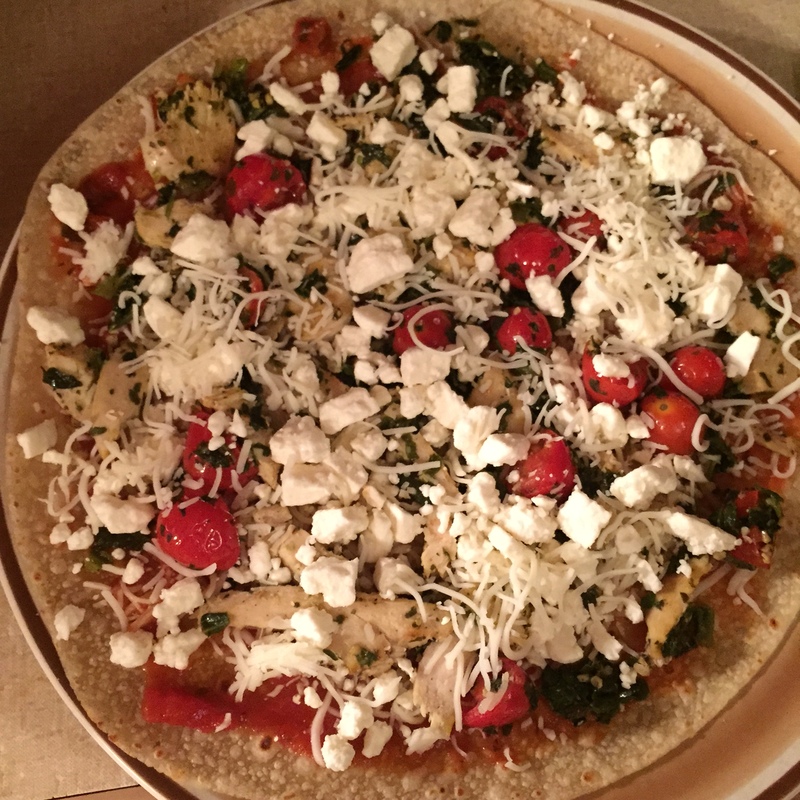 Go crazy with whatever pizza toppings you like…I picked my go-to combo of chicken, feta, and spinach and added some extra tomatoes and garlic. Holy yum. 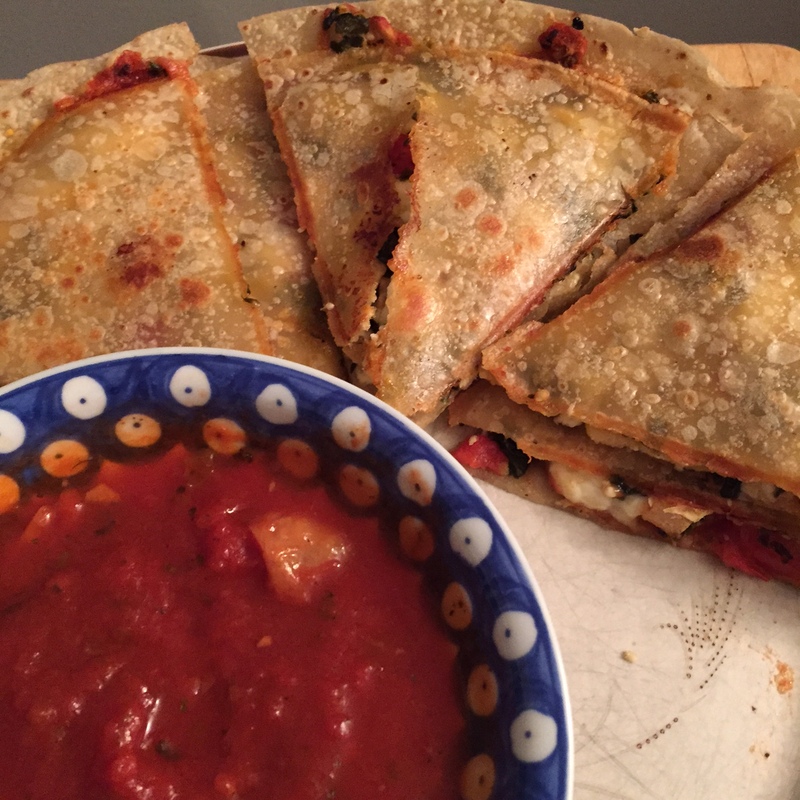 I used brown rice tortillas which I found at Trader Joe’s…I usually use whole wheat, but these had less ingredients so I figured I would try them. 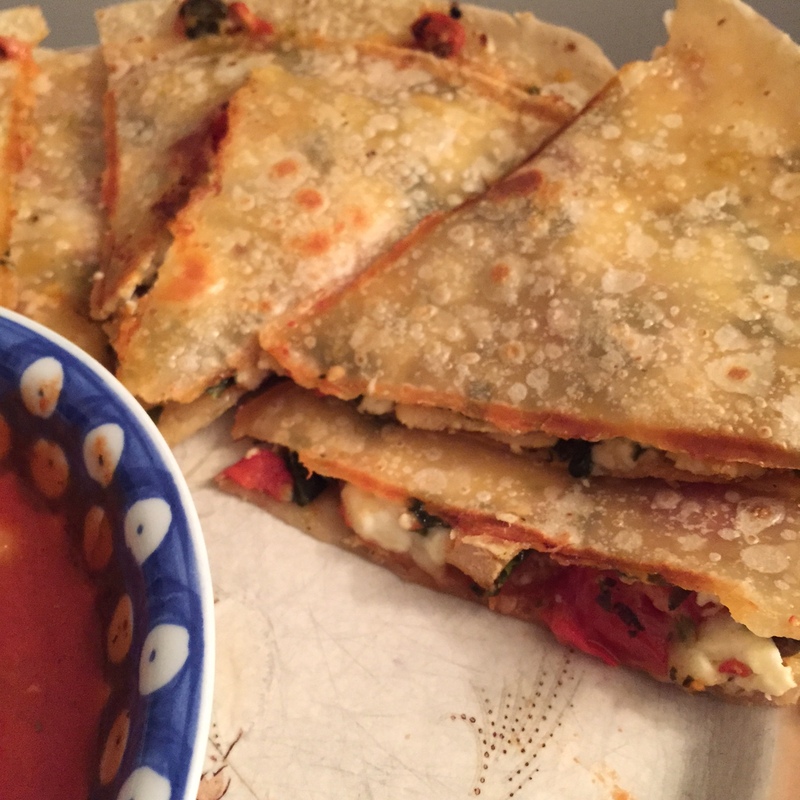 They are less soft than regular tortillas, which worked perfectly here; it made the pizzadillas more crunchy and crispy. 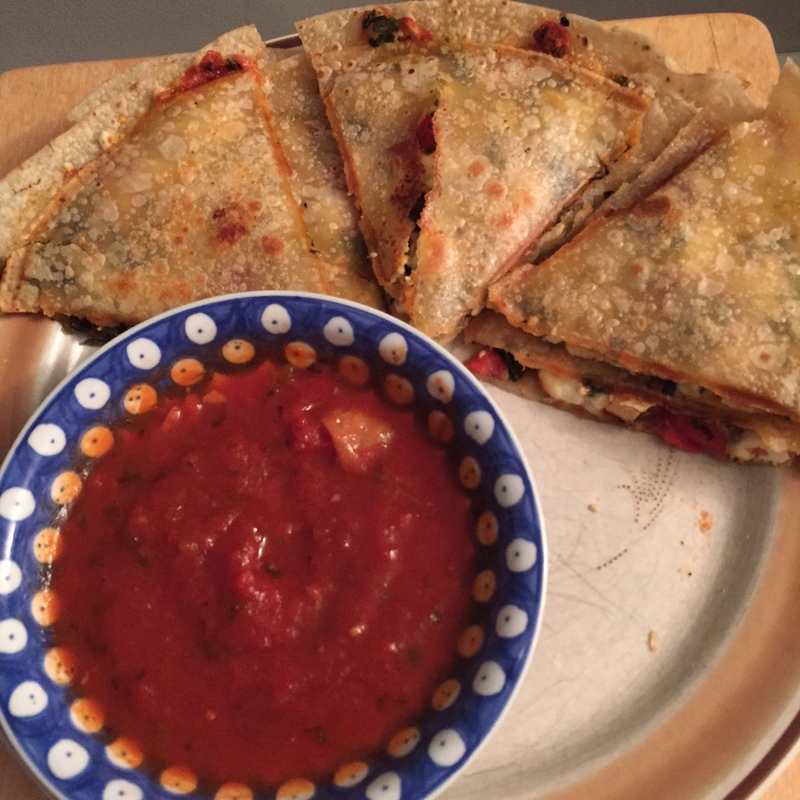 I made them in my quesadilla maker, which is basically a Mexican George Foreman grill that puts the indentations into the quesadilla so you know where to cut it. So quick and easy to make! These would be great as appetizers too; you could make a bunch of different combinations and have them out for people to enjoy. Or you could eat them all yourself, like I did here. Whatever your heart (and stomach) desires! 1.) 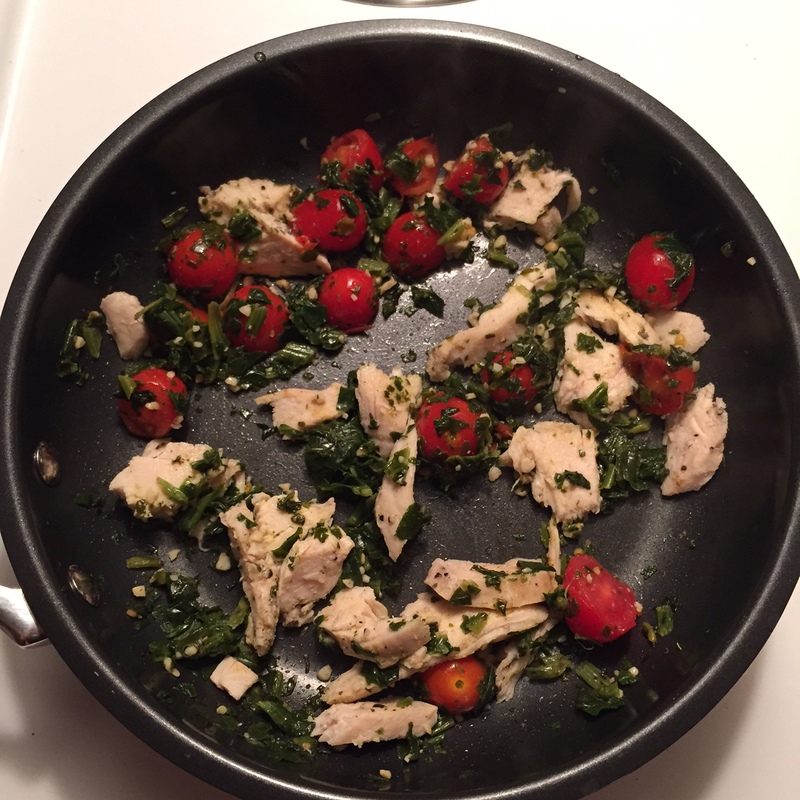 Cook pizza toppings (I sauteed the veggies and added cooked chicken) or use them cold. Take 1 tortilla and lay it on a plate. 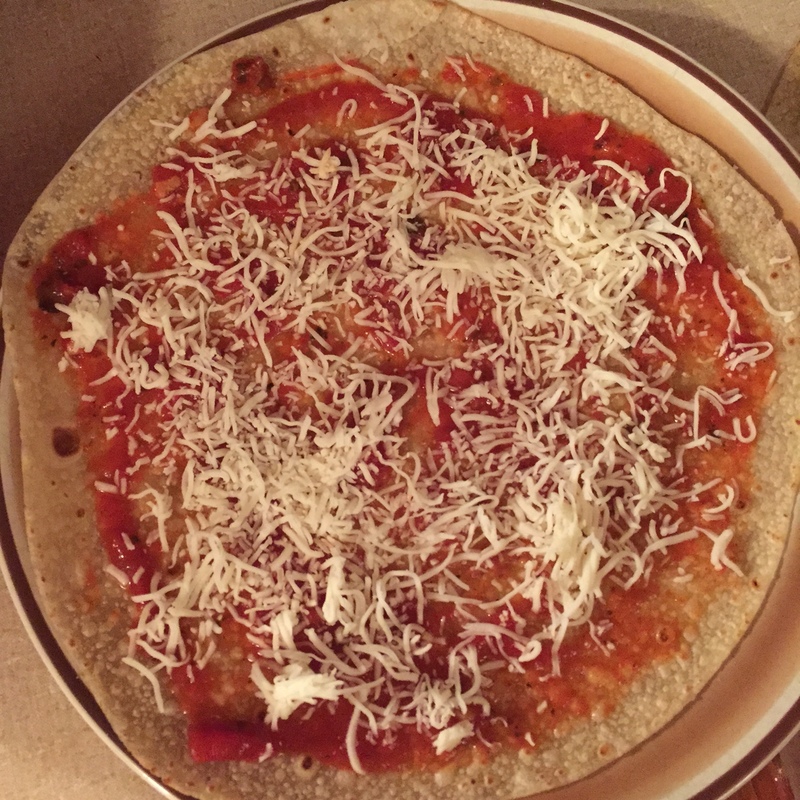 Spread a thin layer of marinara on the tortilla and add a sprinkling of mozzarella. Add pizza toppings and sprinkle with more mozzarella. 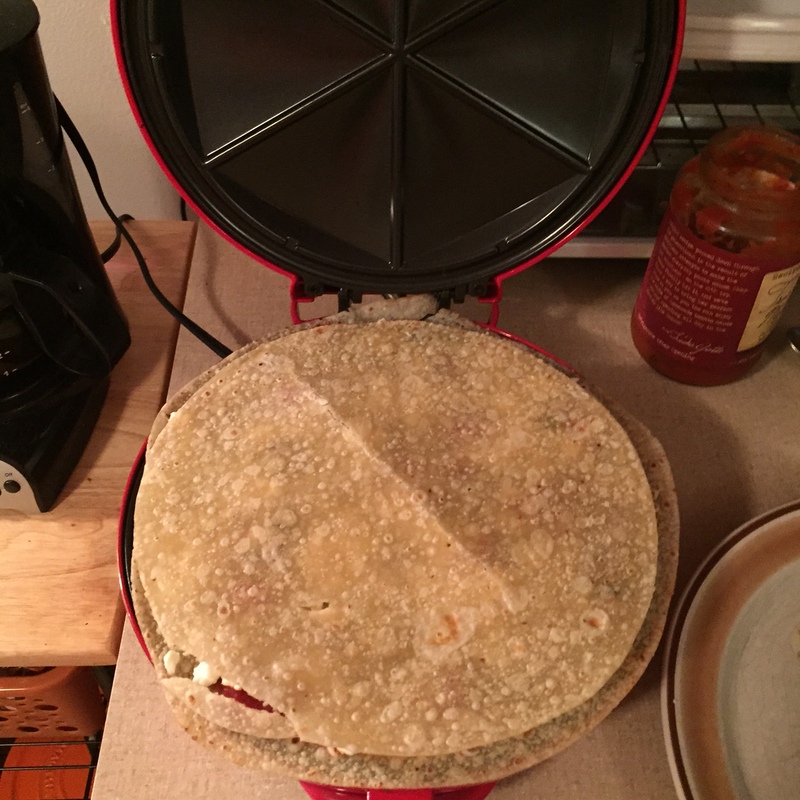 Put other tortilla on top and place in quesadilla maker, pressing top down, or cook in a skillet, flipping once cheese starts melting. 2.) While pizzadilla is cooking, heat a small bowl of marinara sauce in microwave. 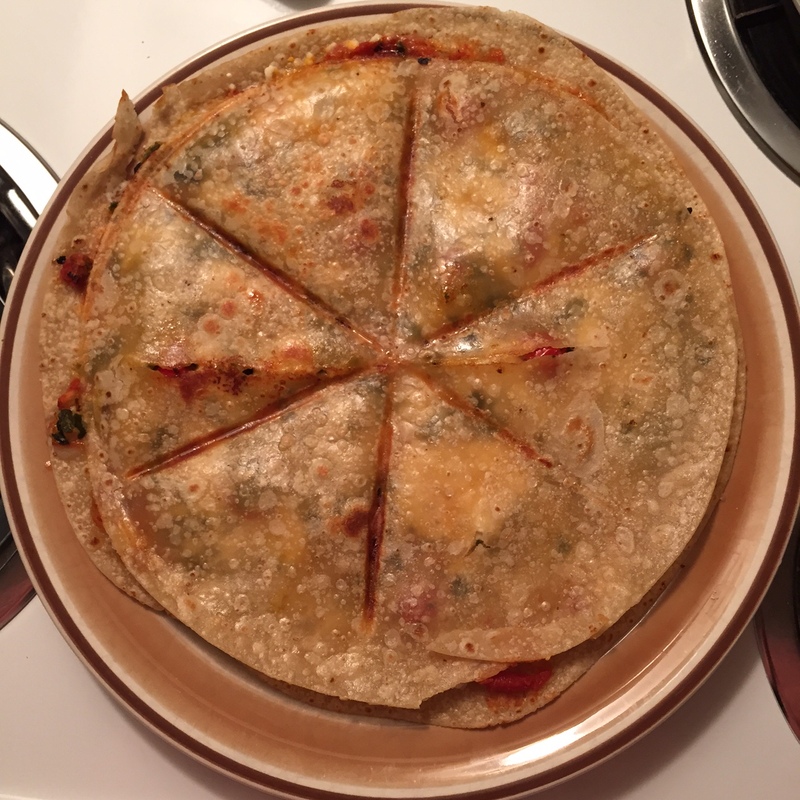 When cooked, let pizzadilla cool, then cut into 6 triangles. Serve hot and dip in marinara!